Classified 3 stars by the services of Tourism of Calvados. In countryside near the landing beaches, character cottage for 4 people, in a 18th century farmhouse on the edge of the forest of Cerisy. A large bedroom, living room with sofa bed, kitchen, spacious shower room with walk-in shower, separate toilet, terrace facing south. Open view over acres of grassland. Downtown with all shops 2 km (butcher, bakeries, press, supermarket, petrol station ...). Shops open on Sunday morning. Baby: cot, high chair and recliner available on request. Immediate proximity to the forest of Cerisy for all your walks, bike or horseback! The gîte is well equipped and very comfy. The place is dedicated to horses and a couple of them could look in while we had breakfast. Otherwise the privacy is complete. The owners were friendly and unfussy and left us to our own devices while providing support when required. Bayeux is a fabulous city to visit - cathedral, museum, restaurants, some sort of embroidery thing. The D-Day memorials are moving and important. It is good to see the Union flag up there alongside the tricolour, the stars and stripes, the Canadian maple, and the Polish flag. We walked through the nearby forest, which is full of trees and outlaws hunting stags. The local village has shops and cafés, and the Abbaye is very interesting indeed once one has grasped the characteristically arcane nature of its opening hours. Cider and biscuits were provided and disappeared swiftly. Recommended! 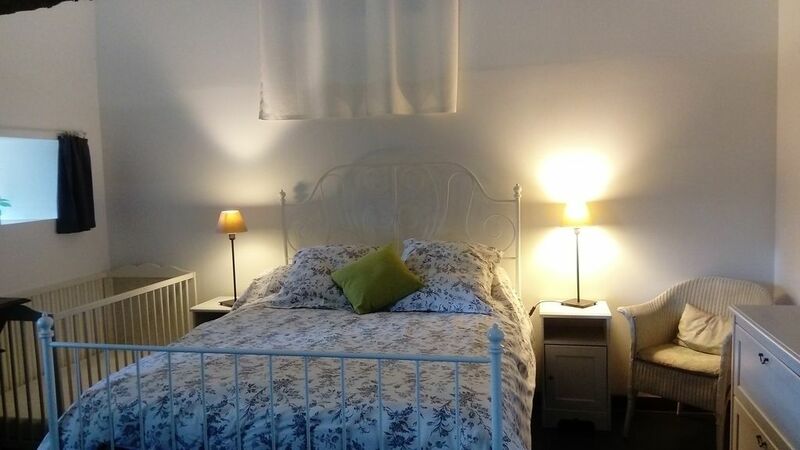 I used this comfortable, spacious, and quiet gîte as a base for visiting Bayeux and the Normandy coast, and could happily have stayed much longer. The countryside around is lovely, the location of the gîte is very good for practicalities like grocery shopping in addition to the tourist things to do, and having the horses as neighbours somehow completed the experience. High quality and superb location for visting Bayeaux anf the D-day beaches. Excellent accommodation, plenty of space and fully equipped. Nice location with views of the meadows and hedgerows, convenient for local shops. great location for exploring the D-day beaches and Cotentin national park. Beautiful, tranquil and charming. Great location for enjoying and exploring Normandy. Lovely host family and idyllic setting. Woke to see horses in the pasture outside our window each morning. I can't say enough about the host (friendly, generous), the accommodations (comfortable, gorgeous setting) or the town (Le Molay Littry, in one word - perfect.). We are very grateful for the time you gave my daughters around your stables and horses - thanks so much. Option ménage fin de séjour :40 euros par séjour Location de draps : 10 euros par lit Location de linge de toilette: 5 euros par personne Caution demandée à la remise des clés : 300€ par chèque Tarif location boxe cheval : 20 euros la nuit.